This entry was posted in rifle, rkba, self-defense, training, weapon and tagged 223, animated, AR15, Faxon, feminism, girl, hostage, left hand, little, piston, scared, target, woman. Bookmark the permalink. 5 Responses to Don’t wait for a knight in shining armor. Interesting rifle. Looks like an ambi ejection piston ar upper– which I’m completely unfamiliar with. I will be posting more about it soon: it’s a Faxon left-hand long-stroke piston upper (also made in right-hand). Basically AK style gas system but with a FAL-type regulator. No gas in the receiver, almost none from the ejection port (I could shoot left-hand version comfortably from the right shoulder), suppresses gracefully (zero blowback) and has very mild recoil. Can be used with folding stocks. Barrel is a quick-change type, 223 or 300BLK. I am a fan. More info in target base? Awesome design for realistic training, in my opinion. 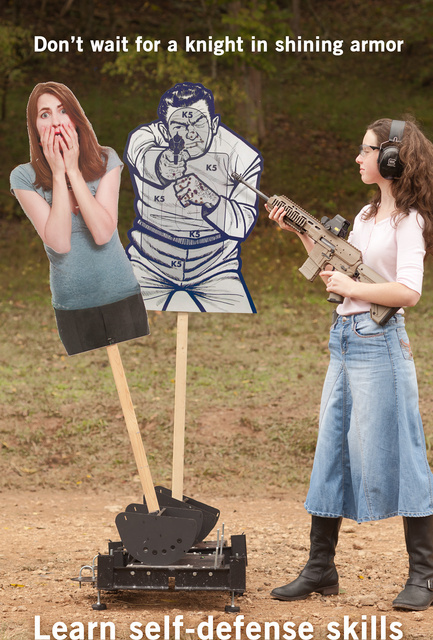 Thanks for the image post and link to our Extreme Hostage Target system. More Info: The hostage targets can be setup with a small cardboard ‘wind sail’ for random movements, or you can use the rear pulley system to attach a line for manual control of the hostage.